This is wonderful! A Pi Song written and performed by Middle School teacher M Bernfield which takes the numbers 1, 2, 3, 4, 5, 6, 7, 8, 9 and 0 (almost came over all Sesame Street then!) and plays them as π as a series of notes. This was then used to write an accompanying song from the C Major Scale. Take a listen - the initial setup is a little slow but it is worth waiting a few seconds for the song to kick off! The lyrics are fun and the whole song manages to take Pi up to almost seven hundred places. Excellent! So, Happy Pi Day everybody! Why today? 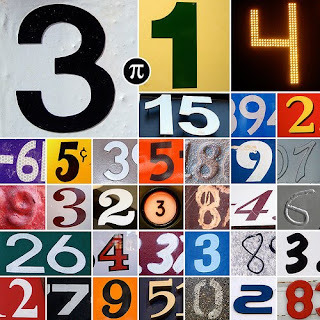 Well it is the fourteenth day of the third month and if you express that as 3/14 then you get the first three digits of π - 3.14. OK, so it goes on for a lot (!) longer than that but our calendar has certain restrictions. We all like constants in our life so π, being a mathematical constant whose value is the ratio of any circle's diameter to its circumference is perfect! Did you know, too, that it is Albert Einstein's birthday today? Great coincidence don't you think?